Housing and planning statistics play a vital role in helping to inform decision-making of all kinds across the UK. In January I blogged about the progress made in joining up statisticians across departments and the devolved administrations – both at an operational and strategic level. I reflected on the balance between driving forward improvements whilst understanding that individual countries within the UK often have separate policies and legislation relating to housing due to devolution. Building on the momentum of work completed in 2018/19, statisticians from England, Wales, Northern Ireland and Scotland joined forces again in March 2019 to look forward to what we can achieve together. A theme through our discussions was that we should be guided by the needs of our users. 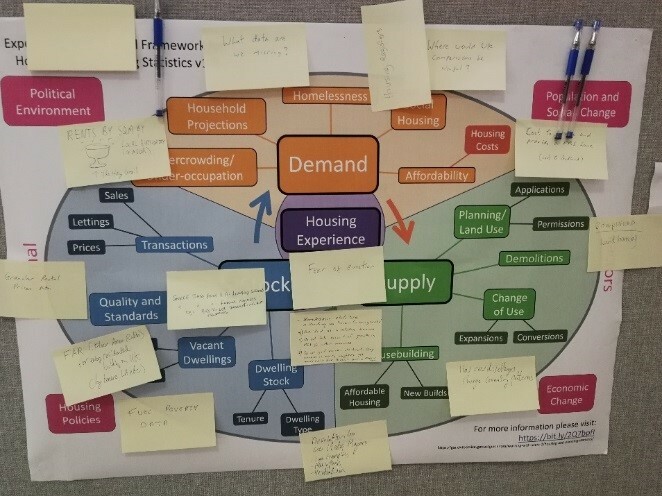 We ran a user session on cross UK statistical coherence at the Welsh Government’s Housing Information Group Seminar in January (slides here). We built on this at ONS’s Population and Public Policy Forum in February. This event focused on the private rented sector and was attended by more than 100 people from central and local government, academia, industry and the third sector. It was a great way to get feedback on our cross-government work and hearing directly from users highlighted the ongoing challenges – including the need for more data on people’s housing “experience” and more data on how and why people move between tenure. Joe Lane from Citizens Advice reflected on the event and slides have been published. We aim to run similar sessions in Northern Ireland and Scotland later this year. The post-it notes on this diagram show feedback from users on the experimental Statistical Framework. This tool was created to communicate what is currently measured and identify priority areas for improvements. The Government Statistical Service (GSS) Harmonisation Team is also continuing to work closely with stakeholders following the publication of their report into the potential harmonisation of homelessness definitions for statistical purposes. The commitment to improving users’ understanding of the comparability of homelessness statistics has been welcomed by users including the Centre for Homelessness Impact. We’re now pleased to release our work programme for the coming year. This sets out our priorities against our five key areas of improvement: coherence, quality, harmonisation, data accessibility and user engagement. There’s a focus on learning from each other and sharing good practice across departments and devolved administrations so that we make the best use of our resources. Future priority areas for statistical harmonisation are also provided in the workplan and include an investigation of the definitions and terminology used for Affordable Housing statistics. We’re keen to get feedback from users and you can access a survey here. This is your opportunity to help inform the work we do improve the quality and value of housing and planning statistics. Our survey will be open for responses until the end of May 2019 and should only take between five and ten minutes to fill out. We are conscious that individual countries often have separate policies relating to housing due to devolution, your views will help shape where we prioritise resource to improve coherence and comparability. As we hear more and gather more feedback, we will refine and enhance our plan. As I concluded in my January blog, we look forward to building on the momentum of the collaborative work already completed. 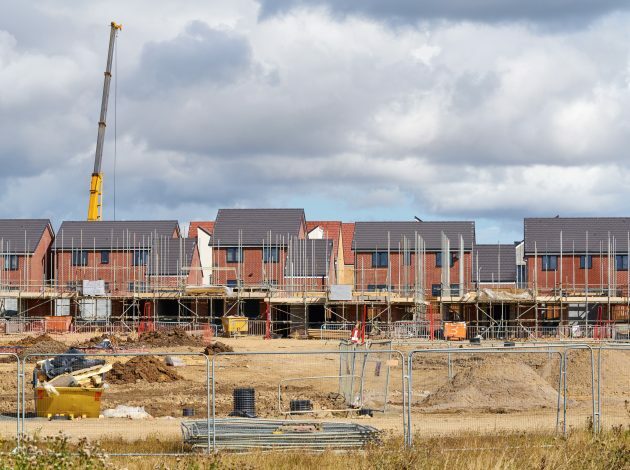 Getting your feedback on priorities will help ensure that our statistical outputs can best shine a light on society’s evolving questions about housing and planning in the UK. Please e-mail gss.housing@ons.gov.uk to join our mailing list. 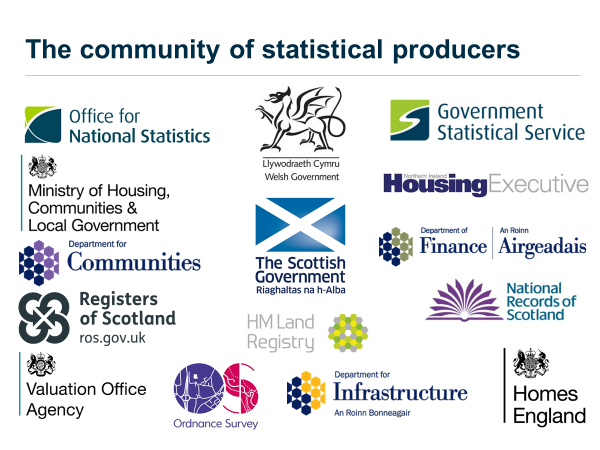 The community of statistical producers working together to improve housing and planning statistics.